It was a dark, almost ebony jungle with black jagged mountains and dark clouds in the background. The only touch of color was a small yellow orchid on a gnarled tree in the foreground. The dark jungle, night sky, and the gothic mountain was definitely me, and the small touch of living color was about the right size. A plaque with those words hung in Stuart Kaminsky's office, the place "where the magic happens," his young daughter, Natasha, said proudly more than a decade ago. I walked into the room, awed and honored to be there. As my eyes swept over the shelves of books and a desk stacked with papers, I thought about why some writers have the ability to make magic with words while others do not. Stuart Kaminsky passed away on October 9, 2009, a sad day for the literary world, for thousands upon thousands of Stuart's fans and many friends worldwide. We will miss this incredibly talented man who gave so much and had so much more to give, had his life not been cut short, halted before some of his dreams could be fulfilled. He had planned to write a long book about three very different women, and he had in mind to write another series. I would have loved to have read these books, to have caught glimpses of Stuart through his characters' words and actions. 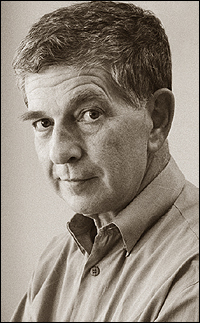 A film scholar turned detective novelist, Stuart wrote more than sixty crime novels, which began in 1977 with Bullet for a Star. The debut novel introduced Toby Peters, a Hollywood private eye in the 1930s and '40s, whose clients were celebrities during those eras. He loved the old black and white movies, Mildred Pierce, his favorite. What fun he must have had while writing Mildred Pierced, a Toby Peters' novel featuring Joan Crawford. In addition to the Toby Peters series, he created and sustained three other series characters; Abe Lieberman, Porfiry Rostnikov and the latest, Lew Fonesca. He genuinely liked all his characters and found working with them a pleasure. He also liked to go from one to the other. "It is like returning for a long visit with an old friend," he once remarked. "Rostnikov is good company." "I love what I do," he once said to me, a smile lighting his face. And he did. He chose Toby Peters' clients because he was intrigued by them, and what better way to learn more about them than through research. For this reason, he also wrote film biographies; Clint Eastwood, Ingmar Bergman, John Huston, and Donald Siegel. He also taught film and wrote several nonfiction titles about cinema, wrote screenplays and plays, and in 1989, he won an Edgar for his novel, A Cold Red Sunrise. As past president of the Mystery Writers of America, he was named a Grand Master in 2006, the honor being the organization's highest. Why do some writers possess this magical ability to transcend? Perhaps I need look further than to Einstein's words, to take them in as Stuart had done. He lived life with his eyes wide open, embraced it with an open mind, was eager to listen and paused to wonder - inherent qualities not only found between the covers of his novels, but at home, in the company of strangers, in a quiet café talking with friends, dipping biscotti and drinking coffee. Add to those qualities a sense of humor that sometimes sailed over heads and became lost in the sound of his own quiet chuckle. He also enjoyed "private" jokes when he wrote, especially the Sarasota novels. These gems are sprinkled throughout the pages, and one in particular comes to mind. During the time he wrote Retribution, he lived in a community known as Sherwood Forest, which is where he sent his protagonist, Lew Fonesca, and Fonesca's sidekick, Ames, to find a suspect by the name of Mickey Merrymen. He enjoyed other inside humor, such as plot twists that parallel films in which celebrity guest stars appeared, such as Murder on the Yellow Brick Road, that in many respects parallels The Wizard of Oz- Judy Garland tossing coffee onto the murderer at the end, just as she had thrown water at the Wicked Witch in the movie. In his novel, Midnight Pass, there is a passage describing a watercolor painting that hangs in Lew Fonesca's office. Lew, the protagonist in Stuart's Sarasota series, is just a guy taking odd jobs and trying to get along, easing through life with a gaping hole in his heart put there when his wife was killed. The painting, given to him by a friend, is the one thing he cherishes. There is much mystery in Stuart's thought provoking passage, It was a dark, almost ebony jungle with black jagged mountains and dark clouds in the background. The only touch of color was a small yellow orchid on a gnarled tree in the foreground. The dark jungle, night sky and the gothic mountain was definitely me, and the small touch of living color was about the right size. Those intriguing words defined the person Fonesca saw himself as being. The passage captivated me. I not only reread it twice, but paused to wonder if the painting had been real or if Stuart's imagination had created it. On various occasions, I had meant to ask him, but I would forget. Six years later, one morning in January this year, in a quiet room at Selby Garden, the answer presented itself in an extraordinary way. Usually the Tai Chi class I attended with Stuart and Enid met Bayside, but because of the chilled wind whipping over the water, the coordinator opened up a room inside the Selby mansion. Upon entering the room, my eyes were drawn across the way to a watercolor painting. Although other paintings lined the walls, I walked straight to it, my mind telling me that I knew that painting, that I had seen it somewhere. But where? I studied it, my eyes working with my memory, sweeping down the dark jungle to the artist's signature. I stood there mesmerized, almost shocked as it came to me. In Midnight Pass, Stuart had revealed that Lew Fonesca had met the artist, Stig Dalstrom, at Patrick's, a Sarasota restaurant. Lew had wondered how much one of his paintings would cost, because he wanted one. Coming out of my stupor, I looked down to the plaque below the painting. 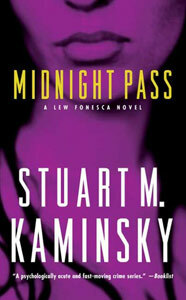 Tribute to Lew Fonesca- Midnight Pass- a Stuart Kaminsky novel. Now I had my answer; the painting in Lew Fonesca's office was real, the artist real. Stuart had made magic with his words, had painted a picture with them with such clarity and detail that I had seen the painting in my mind, my eyes never privy to it until that moment. What an extraordinarily talented man, an artist of great and exemplary skill, a master of his craft. As I continued to gaze at the painting, I had a question much like Lew Fonesca; how much for this painting? I had recently earned my first money for a story, and I wanted to buy something special, something that would reflect my passion for writing. This painting was perfect. After class, Enid, Stuart, and I tracked down the answer- the giclee was for sale- for the exact amount of my earnings. It seemed to me that Fate had decreed the cause of these events, had added that touch of mystery that makes one wonder. Now when I look up from my keyboard to the framed Stig Dalstrom's Tribute to Lew Fonesca and read the passage from Stuart's Midnight Pass, I am ushered along a path of a great friendship, of spoken words that made laughter or caused reason for a deeper thought, of book signings and film critiques, and of Christmastime celebrations.